Michael-Forest Meservy is the lead Scholar and instructor of the Noble Science Academy. 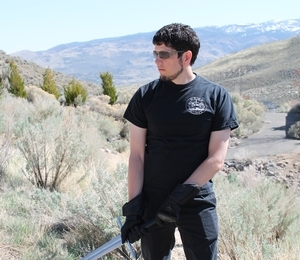 Michael-Forest initially began his study of the longsword in 2001 under the instruction of Jake Norwood. Since founding the Academy, Michael-Forest has developed an efficient curriculum containing comprehensive systems for teaching and learning the longsword, rapier, and sword & buckler based on historical principles, terminology, and techniques, and has taught at events all over the country, including at Longpoint, SoCal Swordfight, and IGX. He is a certified instructor of the HEMA Alliance, and also holds an MLitt in Medieval History from the University of Glasgow.